Well as promised, I have looked for information on how to change the layout of your blog. I found this great youtube video from http://www.digital-photography-how-to.com/. I usually do a search on yahoo for "free blog templates" and find the one that I like and copy the HTML file. Make sure you do save a back up of your current blog layout in case something doesn't go right. I know it happened to me so I just restored it and started again. Enjoy. I'll be looking to see how many of you change you layouts. Hello everyone, I have been pretty busy, as always, my kitty, Diasque is doing great. His insulin shots are working out great, yesterday the vet said that she won't see him for another 2 to 3 month. Yippie!!! He now hates his carrier, where before he used to love going into it. I'm still getting used to giving him his shot, I feel bad when he meows that he doesn't like getting poked or when he looks like he's choking from him horse pill for potassium. Only 4 more days of that pill and then only insulin shots. I'm going to post about how to change your layout. Stay tuned. Well have a great week everyone. Today has been such a wonderful day. At 1027am, this morning I officially became a US Citizen. My mom and I were among 1354 people who were given the oath of naturalization, we were all from 102 different countries. It was such an emotional day. I don't have my camera right now, otherwise I would post some wonderful pictures that Suzy took of us. Also, I'm too tired right now to go and grab all the notes that Linda took for me with all the details of today, but that's how I know the time. I was way too emotional, I always cry when they sing "Proud to be an American" and today, I couldn't even sing it. I was bawling. Great day. Then the girls at PMP threw me a "Citizenship Party" at the store and it was so much fun, but couldn't stay that long as we got the greatest of all news today. Diasque was going to be released at 730pm. Thanks everyone who attended, I appreciate everyone who was there. Thanks so much. My kitty is home, he is sleeping in my bed just like always and he is almost back to normal. He will be on insulin shots for the rest of his life. But he is alive and well. Too cute, I will try to take pics of him and his "battle wounds". But he is here and just like his old self. I'm so happy. Thanks again for all you prayers, comments, emails, calls. They have been so great to read and to help me go thru this time. Well today, we have made history. President Barrack Obama has taken office. Diasque is doing better. He is still not eating and they are saying if we can get him to eat, then he can come home. I will visit him tonight, and try to get him to eat anything, tuna, shrimp or turkey deli slices he likes. I will talk with the vet tonight and see how his doing. Thanks everyone for the nice thoughts calls, emails, comments and prayers. I'm so happy to have such great network of supporting friends. I'm truly blessed. Thank you from the bottom of my heart. Tomorrow is going to be a good day too. It's finally the day we have been waiting my mom and I for the last nineteen years, one month and one day. I will become an official US Citizen. YEAH!!!! I'll even have my own professional photographer, LOL, my dear friend Suzy is going to be taking photos at the Oath Ceremony. I will try to update on Diasque status. Thanks again. My heart is so broken right now. My precious little Diasque is not doing so well. He is at the Vet hospital as we speak getting treated for Diabetes. He has a really bad case, so they are giving him IV and insulin to try to regulate his blood sugar level. He will be there for the next 3 or 4 days. If he makes it he will most likely be on insulin for the rest of his life. I had noticed the signs, drinking more, peeing more, I mentioned it to the vet on his annual checkout and she diddn't seem too concerned and did mention that maybe if he keeps peeing that much we should run some test. But things occured too quikly from then to even catch up with her. I'm writing all the details below as a way for me to track his issues. On Friday January 9, we gave him his annual shots and he must have had an allergic/antibiotic reaction to the vaccines and he scratched a patch off his fur near where one of the shots was give on Sunday January 11. By Wednesday night, January 14 he started to sneeze, so we called his regular vet and he was seen on Thursday, January 15. He was on steroids and he seemed ok that night, little sneezing. It all started to go bad this past Friday January 16 when he stopped eating and drinking. On Saturday we tried to give him food but just didn't eat much. So we force fed him a little bit to try to get him to eat but to no help. On Sunday we took him into another vet as my vet is not open on Sunday or Monday, around 9am because he didn't look good. We explain all the symptoms and the Vet thought he would bounce back and upped his does of steroids and gave him an appetite stimulant. But still he just didn't look any better and today we took him in again in the morning. The vet was at a loss and told us that he would like to do blood work. Around noon, he called us back and told us that he has Diabetes. And it's an emergency, he needs IV and insulin to control it. He would stay in the vet hospital for 3-4 days. Tonight, I'm going to go see him and bring him some food hopefully he will want to eat and he is better. I know I have been pretty needy in the last months about prayers, but can you please pray for Diasque that he is able to bounce back from this little detour. Here he is, one of my favorite photographs of him. Have a good day, I'll try to keep everyone updated. My Little Shoebox (MLS) is releasing six different lines this CHA-W, which is at the end of the month in Anaheim, CA. Suzy is the lead designer for MLS and has asked me to design two projects using two different lines. 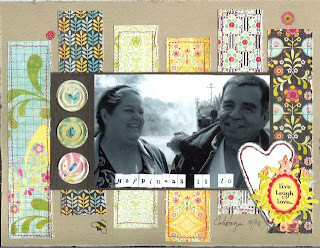 I got my first project complete and I'm so excited as it will also be my April class at Picture me Perfect. The message board is using the line called: Flawless. Enjoy. I will post my other project when I get it finished. Also, many of you have commented on my blog layout. I will find a mini tutorial to explain how everyone can update their layout. But it will be maybe next week, as work is really busy and have to complete other stuff too. I can't believe that the new year is in full force. It's going by so quickly. I have tons of stuff to do as always, but it's coming along. So many things planned for the upcoming year, with work, with scrapping. I have been in purging mood, since Thanksgiving, that I was hoping I would finish during the Christmas break. But it didn't happen because I got sick with a cold and just stayed in bed all day. I guess it was good I got a break, but I really want to be over with the purging and organizing. We had a garage sale this week at Picture Me Perfect. It was great to see that some of my stuff is going to be used rather than just gathering dust in my room/garage. I still have more to purge but slow steps are in order. I may even show a picture of my garage once it's all clean and organized with my scrap stuff. 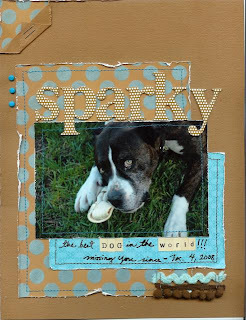 The Sparky layout was very helpful and therapeutic. It has probably the best photo I ever took of him, it's my favorite. We just got his ashes back on December 30th. It was difficult day for us, but we know he is now in a better place. So we are trying to move on. As part of my self-imposed therapy to help me move on from Sparky's passing, I went to see Marley and Me with Suzy, Janice, Victoria and Maria. I cried non-stopped, but it helped me with closure. It's a great movie, well done, I can't believe how close it is to the book. I haven't read the entire book, only the chapter that deals with Marley's passing as I got the book the day after Sparky passed. I know I will read the book soon. It's such a great book. We miss our buddy, but it's getting better everyday. As I mentioned last week, my dear Michelle lost her superhero of a husband, Marshall, on December 27th. I'm so proud to belong to a very special group of scrapping ladies that came together and helped as much a we could. With that note, my friend, Debbie is hosting a crop in Marshall's memory at PMP on February 15th, 10am-8pm. For more details go here or email Debbie. All proceeds will go to the American Heart Association. If you are in the area and can't make it you can still donate. I will be doing a demo during the crop. So come by and check it out. Also, my class is coming up on Saturday January 24th at 2pm. Sign up for it at the store. So, I'm one of the thousands of people who tried to get the Becky Higgins kit for the 365 Project, luckily, I got one of the kits and have been trying to take a picture a day. If I can't take the picture that day I have a spreadsheet where I make a note of what I wanted to take the picture so I can take it on another day. So far it has been working. I'm excited to be getting the kit and completing it this year. 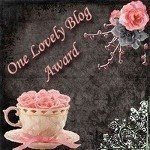 I have been awarded the Lovely Blog Award from my friend Patti. 1. Add the logo to your blog. 2. Link to the person from whom you received this award. 3. Nominate 7 or more blogs. One last note, I'm officially becoming a US Citizen on Wednesday January 21st, 2009. I'm so excited. Can't wait for the day to come.